We all know that WordPress is popular among bloggers, and Movable Type as well. But HOW popular? And what other platforms are being used? To find out, we went through the Technorati top 100 blogs and investigated what blog platforms they are using. It turned out to be a highly interesting survey with plenty of surprises along the way. As a by-product we also found out some interesting things about the more popular blog networks. For example, did you know that Weblogs, Inc. and Gawker Media together have 22 of the top 100 blogs? When you read this article, you might want to keep in mind that we have chosen to make a distinction between blogging services and self-hosted blog software. By blogging services we mean services like Typepad, WordPress.com and Blogger, where a third-party service is handling the blog software and hosting for you. By blog software we mean the software you use when you set up and host the platform yourself (using WordPress, Movable Type, etc). Now let’s get on to the data. Before we dive into details further down, here is a diagram so you can get a quick overview of which blog platforms (and CMS) are the most popular among the top 100 blogs. We found that WordPress is the most-used platform among self-hosted blogs, which perhaps isn’t a huge surprise. It has more than twice as many blogs in the top 100 as Movable Type, the blog platform that came in second place. WordPress is used by 27 blogs in the top 100. Movable Type is used by 12 blogs in the top 100. Only 8 of the top 100 blogs use a custom-made blog platform. Drupal is the only general-purpose CMS with any presence worth mentioning, with 4 blogs in the top 100. An interesting side note is that very few WordPress blogs in the top 100 have updated to WP 2.7 so far. Though WordPress is more popular among the self-hosted blogs than Movable Type, the situation is reversed when it comes to the blogging services based on these blog platforms. Typepad (based on Movable Type) is more popular than WordPress.com (based on WordPress). Blogger comes in at third place. That’s at least if you count the commonly available blogging services. If you also count the AOL-owned Blogsmith that is used by Weblogs, Inc., that ends up having almost as many blogs in the top 100 as Typepad, leaving WordPress.com and Blogger in a distant third and fourth place. Traditional media like Entertainment Weekly, CNN and Wired often use blogging services for their blogs, and most seem to have chosen Typepad. More than one third of the top 100 blogs use a blogging service. Typepad is used by 16 blogs in the top 100. Blogsmith is used by 14 blogs in the top 100. WordPress.com is used by 5 blogs in the top 100. If you combine the hosted and self-hosted versions of WordPress and Movable Type (i.e. 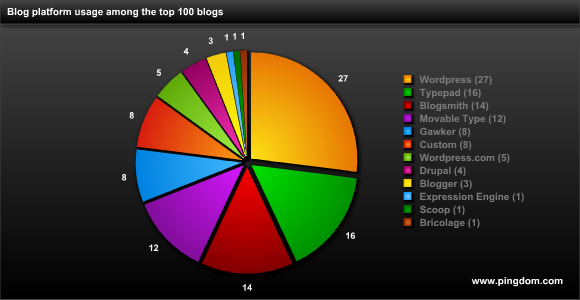 include WordPress.com and Typepad as well), they dominate, claiming 60 of the top 100 blogs. Movable Type + Typepad have 28 of the top 100 blogs. AOL-owned Weblogs, Inc. has 14 blogs in the top 100. All use Blogsmith as a blog platform. Gawker Media has 8 blogs in the top 100. Gawker Media uses its own, custom-made blog platform for its blogs. Wired’s blogs are plentiful as well. There are 9 Wired blogs in the top 100, all using Typepad. We have sorted the list by blog platform, largest first. Gathering this data wasn’t entirely trivial. In many cases you can see directly from the HTML source what blog platform or CMS is being used, and in the cases that won’t work there’s always Google, but sometimes we ended up having to email the site owner for information. We hope you found the resulting collection of data interesting. It’s always nice to get some actual facts and figures, isn’t it? 🙂 Now we know for sure what the current situation is for the various blogging platforms, at least among the largest blogs. We are sure there are plenty of ways to analyze this information that we haven’t thought of. Please feel free to share your thoughts with us in the comments. And what is your favorite CMS or blog platform? We use WordPress for Royal Pingdom. Good stuff, thanks for posting this. We don’t publish stats about it officially but the numbers skew even more strongly towards WordPress as you expand down the long tail. Not a diss on WordPress but I suspect the number of hosting services that support WordPress (and in general support PHP+MySQL) accounts for much of the popularity; folks will opt for whatever is easiest on their ISP arrangement. To clarify, the Gawker Media blog platform is not based on Movable Type at all. It is a platform built and hosted by Gawker Media. @Ian: Thank you. Nice to see someone from Technorati commenting. 🙂 Thanks for the additional information. You might very well have a point regarding WordPress usage. It could partly be a matter of convenience for some users if it’s the “default” option. For the long-tail it seems that Blogspot is still more popular than WordPress. WordPress is more popular among the SEO and blogging-about-blogging type blogs, of course, but that’s because they know the pros cf, Blogspot’s cons. WordPress, anytime for me!!! Interesting to see that there are no Joomla powered blogs. I am along with mass !! proud to be wordpress user. Maybe I missed something… but is this data reflecting unique visitors, page views or some combination of both? Or is this list compiled from the rank on Technorati? Almost feels like an AP or USA Today poll: fair in their bias. Thanks for the resource…was wondering if I could stick with Blogger and still move up the ranks! Hmmm…. Drupal is a great Cms but difficult for some people. Interest list. Personally when it comes to setting up blogs for my clients we almost always recommend blogger 🙂 What I like more about Blogger then WordPress for someone who just wants a simple blogs is 1) Open Source is very susceptible to being hacked and 2) Posts can start driving traffic in less then 5 minutes of being posted, when Google owns the blog engine they know when they need to visit your blog and cache new content. I’m a wordpress user myself! It’s great. I’ve been trying to learn more about blogging software and self hosting and understanding how exactly that differs from using wordpress.com. Have you addressed that on Royal Pingdom? Any suggestions would be much appreciated! I’m thinking now of trying out Moveable Type…is it as search engine friendly as WP? Wired has switched their blogs from Typepad to WordPress. I really like wordpress and it seems to be the one that has the most content, tools and plugins available. Really pleased to see that WordPress seems to be leading the way – I only discovered WordPress fairly recently – I couldn’t believe there was such a great platform which was so easy and quick to use. It’s good to find that I stumbled across what seems to be the best Blogging platform around. Ive used most platforms in the past – WordPress is by far the best, and improving all the time to stay ahead of the competition. I think that it’s important to know exactly which long-term benefits each platform has. I still use blogger and probably always will(because my blog is already established) but WordPress is probably the way to go. WordPress is the best blogging tool. It’s very useful. Really nice job. Thanks you so much. Waiting for 2010 ranking of the best blog. Thanks. I am building my blog with Joomla at the moment. It is much more time consuming than wordpress, but I need some other functionality later on the road. Other than that, I would stick with WordPress! Great list, thank you. We use and recommend WordPress as it really is the simplest of all to install and maintain; especially with the click button installs on most modern hosts. I recently built a Drupal website for Blogging purposes, but really with the amount of effort and constant updates it requires, I advise WordPress rather – save yourself hours of frustration. Thanks again for the list, very informative. I ask the same question as Omega, what has happened to Blogsmith, clearly they’re up there, but you click on all the links and search for them on search engines and it’s very odd, just a homepage with a logo, and no apparent explanation anywhere other than maybe they got bought by AOL at some point – ? Would love to know how all the bloggers behind those Top Weblogs which are using Blogsmith found them. Their search engine has been broken for over 6 months, which is pretty cute considering Blogger is run by Google, supposedly the search engine maestros. This is great information and a lot of effort has gone into producing this. Most people feel safer and more in control if they host their own blogging platform such as WordPress. I always wonder though whether using Google’s own blogger will help in our web site ranking once we have built a following. Google would be foolish not to prioritise their own prodcts over and above all others and although it might be a cynical view, but I believe, it is a strong possibility that this is the case. As always, customer loyalty is what Google is about and all content based productions hosted with a Google product might be an advantage. Google reward good content driven web sites and blogs with a higher page ranking. If you couple this with one of Google’s own products we might just have an edge. Again, this is my view, but there are many things to think about. If you were an advertiser with the Yellow Pages; would they prefer you to supply your own artwork for insertion or use their own examples which they knw produce results. After all, if you fail to create good business you might not be willing to spend again. Yes, this is only an example, and blogger is “free”, but it would make sense for Google to provide you wit the very best results they can. This company will be looking to “up-sell” you later wit adwords or similar products. they want you to do well. I insist to use wordpress. Though many other cmses. It’s my favorite. Nice Post. No surprise that WordPress is dominating this overview. what blog has the best obscenity filter? I’ve been using wordpress for all of mysite. Love the function and customizable ability of wordpress.Very powerful blog platform. Nowasys’s can supply top quality technology consulting resources to our clients enabling them to outsource specific functions at a much reduced cost. For example one of our clients have outsourced their mobile development department to Nowasys. Nowasys’s outsourcing services – has been designed specifically for those organisations who are considering outsource development or who have tried the traditional outsourcing model and found that it does not meet their requirements for responsiveness, quality and manageability. The motivated, dedicated, expeienced Team solution is simple, straight forward, low risk and very cost effective – it refers to a highly qualified, self managing development team, working exclusively for you, and completely under your direction. It gives you all the financial benefits of off-shoring but in a controlled and easily managed way. WordPress is one of the best CMS. I’m using it for all of my blog. check it here http://wirelessthermostatreviews.net and you will find it very flexybel. There are so many plugin also. I love it so much. Nothing’s changed in 2015. WordPress is at its peak. Got an iPhone? Now you can use it with Pingdom!